The DHP Junior Twin Loft Bed with Slide turns any room into a playroom! 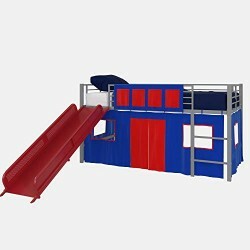 Made with sturdy metal that is stable and durable, it comes with a fun slide that will take your kids room to the next level. This loft bed is designed with all your little ones safety needs in mind and therefore it comes with full-length guardrails, an integrated ladder and secured metal slats. Made to use without a box spring, this bed accommodates any twin standard size mattress of maximum 6-inches high (sold separately). This DHP Junior Loft with Slide comes with the fun Blue Curtain Set. Your little ones imagination will run wild when playing inside this exciting fort: the hanging panels create a hiding place that can be used to play, relax or just hang out. The panels on the guardrails come with storage pockets perfect for storing toys, books, and any other knick-knacks. Watch your kid enjoy climbing on the bed and going down the slide all day long! This loft bed is intended for children aged 4 years of age or older. Loft bed dimensions: 98.5″L x 77.5″W x 43″H. Weight limit: 200 lb.